The man accused of setting off bombs in New Jersey and New York last month initially told police who found him sleeping in the doorway of a building that he was homeless before getting in a gun battle with officers responding to the scene, newly-released police body camera footage shows. 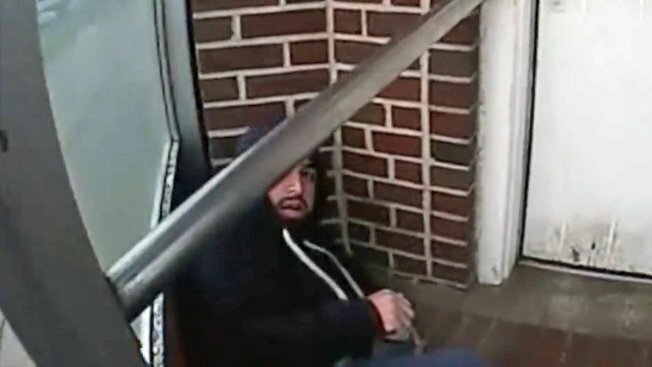 Footage released by prosecutors in New Jersey shows Ahmad Rahimi -- the man accused of setting off bombs in Chelsea and on the Jersey Shore on Sept. 17 -- curled up the temporary vestibule of a bar in Linden as the rain fell just moments before he fired on officers on Sept. 19. The video begins with the officer in his patrol vehicle. He sees Rahimi inside the vestibule and shouts from the car "You can't be sleeping on somebody's door" at the suspect. He then gets out of the vehicle and begins asking Rahimi why he's there. Rahimi responds by giving a false name and adds that he had been homeless since losing his job and being evicted from his apartment in Perth Amboy. "I lost my job and couldn't pay my rent," Rahimi says. The officer doesn't appear to buy the story, and can then be heard telling other officers to come to the scene shortly before the footage ends. "705 and any other units, you can just head this way, standby," the officer says. Sometime after the video cuts out Rahimi allegedly began firing on cops before being shot and wounded. He faces attempted murder charges in the case, but has pleaded not guilty. Rahimi also faces federal charges in connection with the bombings, but he would have to be moved to New York before he can be arraigned on those charges. It's not clear when he would be transported to the Empire State. Police release body camera footage of their first encounter with the accused NY and NJ bomber. Brian Thompson reports.